Agness Mumba, a 2015-2016 Fulbright-Hubert Humphrey Fellow recently completed an internship with Public Health's Ryan White Program. Agness (center) with Thuan Tran and Jonathan Hanft. 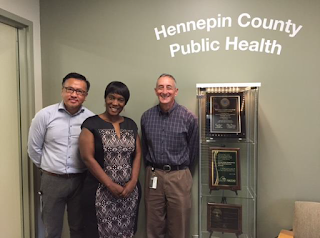 Agness' work addressed the HIV-related health disparities experienced by African-born people in Minnesota. According to data from the Minnesota State Demographic Center, there were 58,856 African-born persons residing in the metro area in 2014. Of these, 1,100 were living with HIV/AIDS. While African-born residents make up slightly less than two percent of the population, they represent 14 percent of people living with HIV. During her internship, Agness developed cultural competency standards and an HIV curriculum for African faith leaders. She also engaged in community outreach with African faith leaders -- forging relationships and prompting many leaders to utilize the new curriculum. Congrats to Agness on her work.